In early 1988, Brian Pohanka was contacted by a fellow who was probably the only movie executive in Hollywood who knew anything about reenacting and living history. His name is Ray Herbeck Jr., who enjoyed reenacting the “fur trade” (mountain men) often at Bent’s Old Fort National Historic Site in southeastern Colorado. There he made the acquaintance of one Bill Gwaltney, who was an interpretive NPS Ranger there. Herbeck was also involved in the 1984-5 production of the TV mini-series “North and South” (based on John Jakes’ trilogy) which was practically the first time Hollywood made use of living history reenactors to any great extent. Evidently he was impressed by our (Brian and I were both there) portrayal of zouaves at 1st Bull Run and he spent some talking to Pohanka about the history of the thing. Fields knew about Herbeck’s living history background and asked him if he could get black Civil War reenactors to be in the film. In the mid-80’s, that was basically the truth – there were a couple of guys in Baltimore doing it and there was Bill Gwaltney. That was it, pretty much. In order to drum up recruits therefore, Fields put together a deal with the C & D Jarnigan Company of Corinth, MS, which was capable of providing a would-be reenactor with literally everything he needed, from forage cap to Jefferson bootees and a musket. The deal was that Jarnigans would sell all that to any black guy who was recruited to be in the movie for $600 – a major discount. But, they had to pay up front, then get the uniform and gear and learn how to use it. When the time came, the movie company would pay each black reenactor fifty bucks a day for two weeks on set which worked out to six hundred bucks for 12 days shooting (less the 2 Sundays.) That way they got to be in a movie and own a complete Civil War outfit, basically for free, afterwards. Next, Herbeck called Brian Pohanka, then residing in Alexandria, asked the same question and got the same response. Ray then told Brian of Gwaltney’s existence, experience and expertise and suggested he ask Bill to be his First Sergeant. 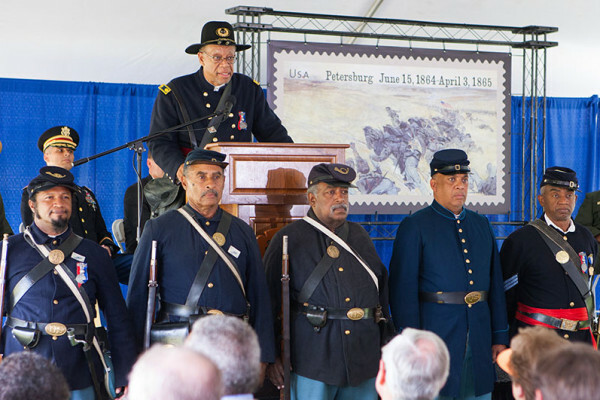 Brian did, and then, as he thought more about the project, he recalled a campfire conversation he and I once had at Fort Ward decrying the lack of African-American involvement in the hobby. We (the 5th New York) had set up a beautifully authentic garrison camp inside the fort, and as we sat looking at it that evening, we realized that there was something rather conspicuous by its absence. Black people! There would have been many in and about such an encampment of the Union Army during the Civil War, but none were to be seen here. Brian and I then went to meet Bill at his office in Anacostia to discuss this radical concept and the rest, as they say, is history. The nucleus of Company B was born. I was working at the Frederick Douglass National Historic Site in Southeast D.C.
Having followed Frederick Douglass from his first house in DC, to his second house in DC, and having spent summers at Highland Beach, where two of his sons built him a house in 1895 (He never lived to enjoy the house) I felt that somehow I knew Frederick Douglass. In fact, he has gotten under my skin and I think of him almost daily. Getting interested in Douglass’ involvement with the Civil War, I wanted to recruit men for what was going to be the First USCT, which was raised in the Washington, D.C. area and drilled on Analostan Island, now Teddy Roosevelt Island near the Kennedy Center. 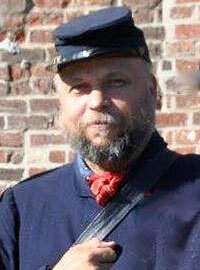 I assembled most of the gear at 125th events and was already outfitted with a M1863 Springfield. 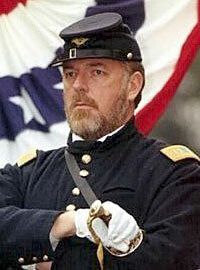 I went to 125th events, such as Gettysburg in the hopes of finding African Americans for the 1st. I found a few, and began planning Interpretive events at the Douglass home. It turned out to be Assistant Producer Ray Herbeck. He was calling from Tri-Star Pictures, and at the time, the film was still named “Lay This Laurel.” It was later changed to Glory. Herbeck wanted to know if I would act as recruiter/trainer for a company of the 54th. I checked with my boss, a fantastic Black woman named Dottie Benton. If anything, she was more excited about it that I was. She told me to proceed and to recruit the Company as a National Park Service Volunteer In Parks group. I knew my way around Fur Trade and Indian Wars Living History, even the Horse Cavalry, but the Civil War was a new area for me. Brian and Jack were already old hands. I remember Brian saying, this could be great, but we need a Black man to be the First Sergeant. Due to my light colored skin, he hadn’t yet figured out I was African American. I soon set that right and off we went together into the recruiting business. Jack, Brian, and I had another meeting which really sealed the deal at the NPS Old Post Office building on Pennsylvania Avenue at the Fox and Hound. 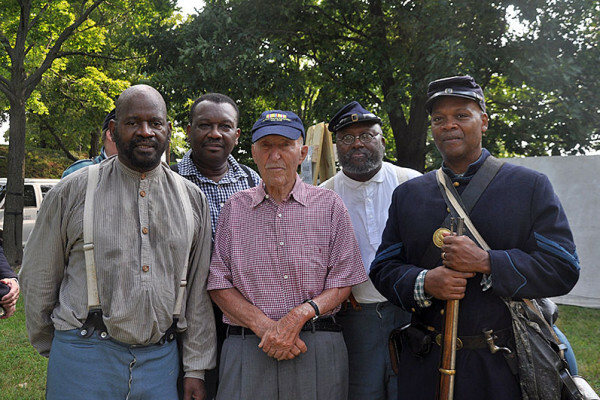 Several Special Interpretive Civil War Events led to our first recruits, who included Walt Sanderson and Bernie Siler as I remember. 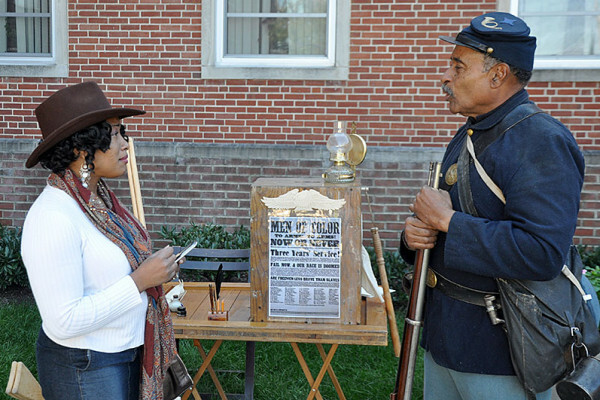 An accurate portrayal of blacks in the Civil War is our objective and in order to achieve this, we need men with a strong interest in history and the motivation to do the job well. Our recruits will have the opportunity to see history come to life and be a part of it. Visit our Membership Information page to learn more and/or to fill out an application.